Thermoelectrics, in particular solid-state conversion of heat to electricity, is expected to be a key energy harvesting technology to power ubiquitous sensors and wearable devices in the future. Scientists are getting closer to designing thermoelectric materials that efficiently harvest heat from the surrounding environment and convert it into electricity to power various devices and appliances, according to a review of the latest research in the journal Science and Technology of Advanced Materials. As reported in the survey article, “Thermoelectric materials and applications for energy harvesting power generation,” devices made with these materials could avoid the need to recharge, change and dispose of batteries. Pictured above is an example of the current state-of-the-art. Schematic illustrations (a) (b) and picture (c) of the flexible thermoelectric (TE) device developed at Nagaoka University of Technology. The flexible thermoelectric device consists of 33 pairs of p-n couples composed of chromel and constantan layers within approximately 30mm × 30mm. For thermoelectric materials to be efficient energy producers, they need to be able to hold heat and conduct electricity well. Thermoelectric materials that can work near room temperature and are flexible would be especially advantageous, particularly for use in wearable devices. Three types of conducting materials are being investigated for use in thermoelectric devices: inorganic, organic and hybrid materials. Inorganic thermoelectric materials efficiently convert heat into electricity, but are not very flexible. Researchers are working to overcome this hurdle. For example, a flexible thermoelectric device was fabricated using chromel (90% nickel and 10% chromium) and constantan (55% copper and 45% nickel) layers covered by a flexible sheet made of polyimide and copper. Micro-thermoelectric generators based on inorganic materials have potential applications in environmental and building monitoring, animal tracking, security and surveillance, and medical treatment. They have already been introduced into commercial devices, such as a body-heat-powered watch manufactured by Seiko. 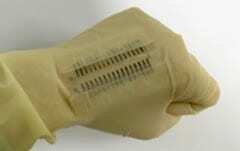 Most organic thermoelectric devices involve polymers. Semiconducting polymers conduct electricity and hold heat better than conventional inorganic semiconductors. They are also lighter and less expensive. Unlike rigid inorganic materials, they are flexible and moldable and can be produced in any shape using 3D printers. However, they are less efficient at converting heat into electricity. Researchers are trying to improve the thermoelectric efficiency of polymers by tuning the composition, length and arrangement of their molecules, aiming to increase the electrical conductivity and crystallinity of the final material. Research that aims to combine the advantages of organic and inorganic materials by blending them together is focused on finding optimal compositions and improving the mixing process. For example, embedding organic molecules into inorganic titanium disulfide crystals makes them flexible and reduces their thermal conductivity. This improves the overall thermoelectric performance. This review article covers the fundamental strategy of thermoelectric materials development to the state-of-the-art realization of high thermoelectric figure of merit achieved in materials suitable for energy harvesting, with the foremost subject being organic thermoelectric materials. Organic-inorganic hybrid materials were also discussed, and for inorganic materials, mainly applicative endeavors were reviewed. Many proof-of-concept works utilizing organic materials and inorganic materials in flexible or micro-thermoelectric generators were also described in detail. Organic thermoelectric devices have an advantage in their general lightweight, flexibility, and potentially low-cost implementation/large area mass production processes such as roll to roll. The wide variety and number of organic materials and speed in which the research appears to be proceeding due to quicker synthesis processes is another attraction. The inorganic thin film devices and micro-thermoelectric generators have advantages such as potential low-cost mass production by utilizing semiconductor foundries, long lifetime, and relatively high output voltage. In either case, with advantages such as no moving parts, high reliability, no maintenance requirement, flexible or small size, thermoelectric devices as energy harvesters, exhibit the potential to replace traditional batteries as the power source for WSNs in IoT. The various applications of these generators are expected to increase, and considering the demand, these devices may become commercially successful. Thermoelectric power generation has not yet reached wide-scale application; however, this situation may be changed by improving energy harvesting devices. The authors conclude that thermoelectric devices can potentially replace traditional batteries in many applications, but a lot of work on improving thermoelectric materials is required for achieving success in this direction.